The model S-4 Rider has the Simonini Mini 2 engine this engine is completely changed by us and made it very quiet and reliable. It has an electric starter as standard. The Fly Products paramotor can be equipped with three different steering systems on the same chassis. The active Hang Low Point on Fixed Point and the Hang Low Hang Active Point. All three systems were tested by the best pilots in the world to internal national and international competitions, thus ensuring reliability and performans top. 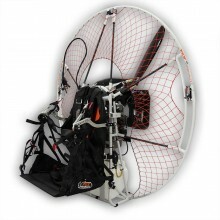 Click the button below to add the Fly Products S-4 Rider Paramotor to your wish list.